Well, maybe uninspiring is a bit harsh... but when you're mentally ready to be on the hook, regardless of the weather or come what may... and then confounded by what DID come. Our glorious launch into our second cruising year fell a little flat. We got underway at about 8:30 in the morning, just as planned. We had some help tossing the lines from our friends on Patty D. Then I had a little mental moment in which I revved the engine in reverse instead of forward gear, realized that we were closing fast on the boats parked across our stern, but saved it in the nick of time. With trembling knees, I got my head back in the game and continued on with no further mishaps. We were on our way! Once Bruce had all traces of our attachment to land (lines, power cords, water hoses, etc.) tidied away, we relaxed and enjoyed the sparkling water and the beautiful South Carolina Low Country as it slid past our lifelines. The cats were a little miffed... they enjoy the sedentary life, but they're cats... contrary to popular belief, they are NOT in charge. We looked back behind us and were surprised to see no less than ten boats approaching. Throughout the day, we were passed by one, then another. Mostly the trawlers, but one or two sailboats as well. We were motoring on a rising tide with luxurious water depths as we traversed Watts Cut. The end of our day lie just beyond the notoriously shallow cut, in the bend of the S. Edisto River. We spent the night in this anchorage on our trip North and felt completely confident and relaxed as we retraced earlier tracks. As we exited Watts Cut and made a left turn, we realized why all of the other boats were in such a hurry... They were pressing on in an attempt to make it to Beaufort, SC before sunset. With the forecast Norther bringing high winds, but not until Saturday, we were happy to enjoy the night on the hook with the anchorage all to ourselves. There are about a dozen crab pots scattered about, and soon our silence was disturbed by the buzz of a rickety outboard engine. These guys sped from one to another of the floating balls... hauling up each basket, dumping the contents, baiting and then dropping it back to the bottom... I thought about calling them over to see if we could talk them out of one or two... but I really don't know how to eat a crab anyway, so who needs that stress? After their departure, the silence fell once more. Until an unfamiliar call echoed across the water. I scrambled to attention with my camera and was thrilled to see two Eagles wheeling about overhead! All too soon, these huge birds disappeared with a departing screech, and we never saw them again. Our evening melted into night with the first of many unique sunsets on our Southbound journey. The current runs swiftly through this river, as it does in most anchorages along this part of the East Coast. Being in a familiar spot greatly reduces our anxiety level and we slept like babies swinging gently on the flat water. The morning was quiet and beautiful. I baked a batch of Apple Cinnamon muffins and sat in the cockpit to await the sunrise while Bruce toweled off the deck. The morning dew is free water for cleaning in his world. The boy can just not sit still! We had no need to be underway before 9 am in order to gain a little bit of water depth with the incoming tide. Today would only be a five or six hour motorsail, so we relaxed over breakfast and tidied things up a bit. 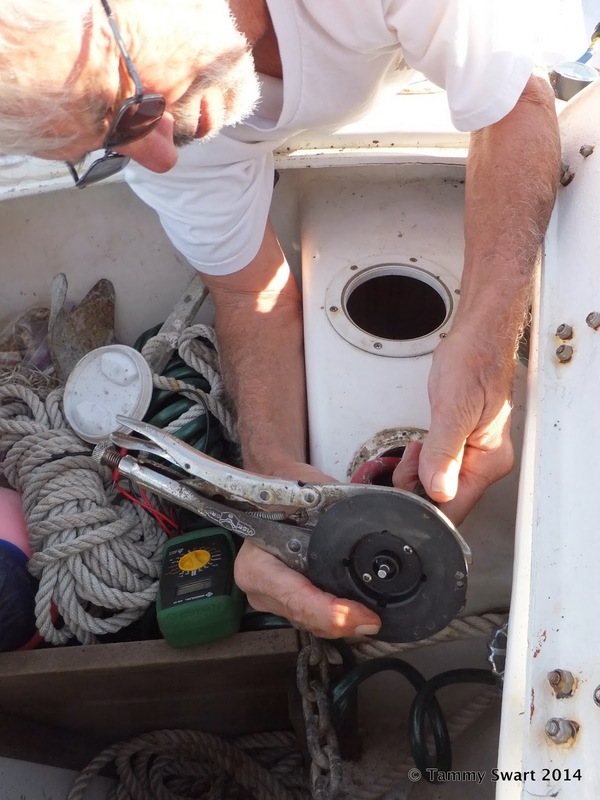 Unfortunately, this was the time that adversity reared her ugly head... Bruce had brought in some of the chain we had out overnight in preparation for our departure... the windlass worked then, but when we had the engine warming up and started to bring in the rest... nothing. Dead. The windlass had betrayed us. Bruce went to work cleaning contacts and diagnosing the problem in hopes that it was a connection issue. He must have worked on it for an hour... he would clean and reconnect a wire and I would flip it on and hold down the switch... dead. The current was coming more swiftly now and if we wanted to get out of here, it would only become more difficult to manually raise the anchor if we waited... I convinced Bruce that he could indeed bring it in... (this is the first boat we've owned that even HAD a windlass), and after some balking... he relented and gave it a go. I think he even surprised himself as he suddenly cried "Anchor is at the surface" and I motored us out of the anchorage to rejoin the ICW South. Retracing our previous path feels comfortable, no stress of the unknown out there waiting to get us... The rising tide instilled further confidence, so when we decided to leave the ICW and the path previously traveled to avoid the Ashepoo Coosaw Cutoff (where DO they get these names? ), with it's multiple shallow spots, it was not in fear, but so that we could see a different part of the coast. With the boat beginning to dance a bit as we approached the St. Helena Sound, I convinced Bruce to abandon his attempts to fix the windlass... I needed him back in the cockpit to trim sails. Just in time, he gathered all of his tools and joined me as the swells and current demanded all of our attention. We had a wildly exciting romp across the sound reaching speeds of near nine knots! This is super fast for our boat. Who cares that we were aided greatly by the incoming tidal current... we were SMOKIN'! Jezabelle got a little bit seasick but things settled down again once we reached the other side. We drifted past Brickyard Point, where we had spend the month before Charleston. The SSCA Cruising Station run by the Butlers, was full of boats enjoying the free stop. 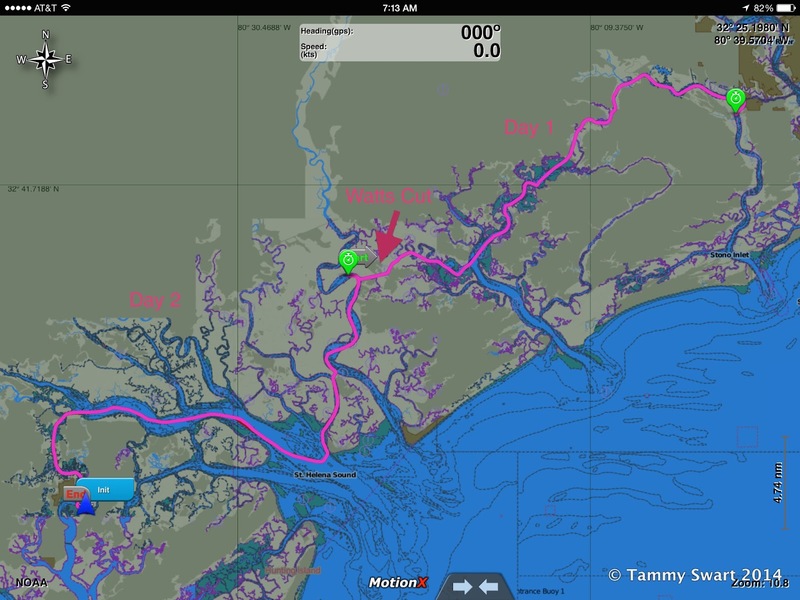 We continued on to Beaufort, where we had hoped to anchor just past Ladies Island Marina in Factory Creek. We discussed our options at this point. We needed to find a new switch for our windlass. Without it, Bruce feared for the health of his back... lifting all of that chain manually would be just too much. With the forecast of winds approaching 40 knots the next day, we made an executive decision. We would call the marina and try to get a slip. The folks at Ladies Island Marina were so much more than accommodating. Several boats due to leave had opted to stay put until after the coming gale. They had little space but did some finagling and found us a primo spot. TJ and Steve met us at the dock and got us settled and we could NOT have felt more welcome! This marina has moved up to "favorite" status, and after St. John's Yacht Harbor... that's saying something! We are mildly disappointed to be docked again and not on the hook... but our disappointment disappeared with the camaraderie of cruising friends new and old. We jumped right in with a Pot Luck dinner upon arrival, followed by catching up with friends met previously in Charleston. After being alone out here for so many months... we have finally joined the Cruiser Migration and are happily becoming a part of the community. So while we wait patiently for our part to arrive (next Tuesday), we are counting ourselves lucky to have landed in this place while the North winds howl and toss the boat about in the slip... uninspiring start? Phooey! Dealing with the unexpected, rolling with the punches, going with the flow... that's what Cruising is all about! So glad you are underway again...be safe have fun and hopefully I will be seeing you out there sometime soon. So looking forward to your wonderful reviews of where you stop and about your adventures. Well Richard, we're pretty much retracing some of our steps from the trip North so far. And as for being under way? Well, we didn't get far without having to stop again for some repairs... these things take time. Luckily, we aren't on a schedule!